The Clarion West community has been devastated by the passing of Vonda McIntyre, our founder. Vonda passed away in her Seattle home on April 1, 2019, at 6:25pm, surrounded by friends. She was diagnosed with stage 4 metastatic pancreatic cancer in February this year, and the swift progression of the disease shocked her entire community. She was 70 years old. Since founding Clarion West in 1971, Vonda has been a continual inspiring presence at the workshop and in the Seattle writing community. She leaves behind generations of Clarion West graduates who benefited from her kindness, intelligence, grace, and wry sense of humor. She was well known among students for her yarn “sea creatures” or “coral brains,” which she crocheted every year for the class as stress relievers. 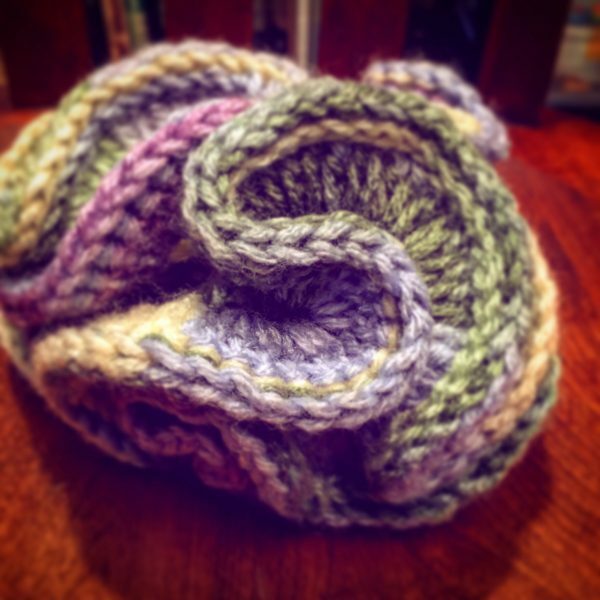 One of Vonda’s “sea creatures.” Photo credit Julie McGalliard (CW ’06). Throughout her life, Vonda was a tour de force in the world of science fiction. She attended the original Clarion Workshop in 1970, where she was roommates with Octavia E. Butler. Just three years later, she won her first Nebula Award for the novelette “Of Mist, Grass, and Sand,” and followed it up with the novel Dreamsnake, which won both the Hugo and Nebula Awards in 1979. She was the third woman to receive the Hugo Award. Over the course of her career, she penned a huge body of Hugo, Nebula, Sturgeon and Tiptree award-nominated work, as well as several well-received Star Trek novels, including one which gave Ensign Sulu his first name, Hikaru. Her Nebula-winning fantasy novel The Moon and the Sun has been made into an as-yet-unreleased film, The King’s Daughter, starring Pierce Brosnan. Throughout her life, she was a champion and pioneer in feminist SF, and remained friends with SFF luminaries all around the Pacific Northwest, including a close friendship with Ursula K. Le Guin, who passed away in January last year. Vonda continued writing in her final months, and just two weeks ago was able to complete her final novel, entitled Curve of the World. It is difficult to express how deeply Vonda contributed to the world of science fiction and fantasy in her 70 years. Through Clarion West alone, she leaves behind 40 years of graduates whose lives and careers have been profoundly inspired and changed by her efforts. We’d like to take this moment to express our deep sadness and regret at her passing, as well as celebrate the wonderful things she achieved in her life. Please check out her official obituary, hosted at File 770, as well as her CaringBridge page, for more from her closest friends and loved ones. A memorial service for Vonda will be arranged in Seattle. She has requested that, instead of flowers, people make memorial donations to one of their favorite charities. Vonda and Ursula K. Le Guin in 2004. Photo credit Kate Schaefer (CW ’92). Allow us to introduce the Clarion West Class of 2019. Hailing from Canada, Mexico, the Philippines, the UK, India, Greece, Sweden, and the USA, these 18 writers will study with Elizabeth Hand, Stephen Graham Jones, Amal El-Mohtar, Ibi Zoboi, Jack Dann, Jonathan Strahan, and Ann Leckie this summer. Congratulations, class! We are delighted to announce that the Sally Klages Memorial Fellowship, inaugurated last year, will be awarded once more to an instructor at this year’s Summer Workshop. 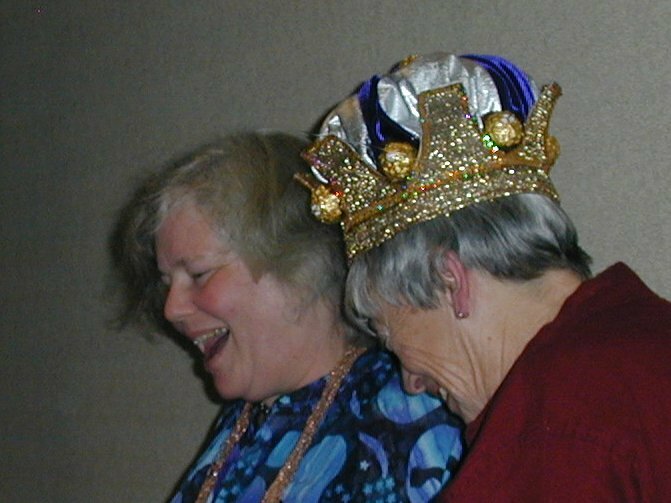 The Sally Klages Memorial Fellowship, presented by science fiction luminary Ellen Klages in honor of her sister Sally, will cover travel, living arrangements, and remuneration for the resident instructor in Week Three of our six-week workshop. This year’s recipient is Amal El-Mohtar. Sally Klages, who passed away in 2016 at the age of 55, was a lifelong writer, athlete, and artist. She was born with Down Syndrome. She was a founding member of the Down Syndrome Association of Central Ohio (DSACO), a board member of the National Down Syndrome Conference, and an active self-advocate. For more than a decade, she participated in the Special Olympics, winning medals in half a dozen different sports. Click here to learn more about the 2019 Sally Klages Memorial Fellowship. Interested in applying to be part of Clarion West’s 2019 Six-Week Summer Workshop? Applications are still open. Learn more on our workshop information page. The Clarion West 2019 Six-Week Summer Workshop will take place from June 23 – August 2, 2019 in Seattle’s University District. Founded in 1971, Clarion West holds a six-week workshop each summer geared toward helping writers of speculative fiction (science fiction, fantasy, and horror) at the beginnings of their professional careers. Each workshop is limited to 18 students, and each week features a different instructor, a highly regarded author or editor offering a unique perspective on the field. Applicants and students come from everywhere in the world, and graduates frequently go on to professional success. Read more about our 2019 instructors on the Summer Workshop page. Applications for the 2019 Summer Workshop open in December 2018. All applicants are eligible for scholarships and/or financial aid. 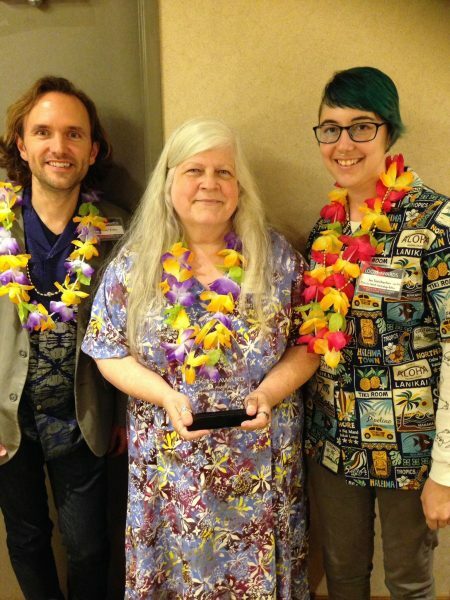 Seattle, WA – The winners for the 2018 Locus Awards were announced on Saturday, June 23. We are delighted to announce that Clarion West is the recipient of the inaugural Special Award for Community Building and Inclusivity. Accepting the award on Saturday were James Tiptree Jr. Award winner and Clarion West board member Nisi Shawl and Clarion West Workshop Director Neile Graham. A full list of award winners can be found on the Locus Awards Website. This is the second major genre award that Clarion West Workshop Director Neile Graham has accepted over the last year. Graham was also personally honored at the World Fantasy Awards for fostering excellence in the genre through her role as Workshop Director at Clarion West. The Clarion West Six Week Summer Workshop is a transformative fiction writing workshop. The program helps diverse writers at the beginning of their career to develop their voice and acquire skills for success. Among writers of speculative fiction, the program is legendary. Each week is taught by a different instructor and while every Clarion West instructor is selected for their contributions to the field, some of the well-known writers and editors who have taught at Clarion West include Neil Gaiman, George R. R. Martin, Ellen Datlow, Karen Joy Fowler, Daniel Abrahams, N. K. Jemisin, and many more. The Locus Science Fiction Foundation (LSFF) is a registered 501(c)3 nonprofit dedicated to the promotion and preservation of science fiction, fantasy, and horror. Its central activity is the publication of Locus, the Magazine of the Science Fiction & Fantasy Field, and its website Locus Online. LSFF is also responsible for the annual Locus Awards, first presented in 1971, to recognize excellence in science fiction and fantasy literature. In addition, the Foundation is responsible for preserving the Locus Collection, a large, historical library of speculative fiction materials. 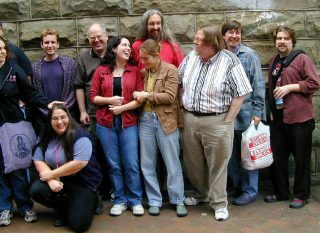 Clarion West Writers Workshop a nonprofit literary organization based in Seattle, Washington, with a mission to improve speculative fiction (science fiction, fantasy, and horror) by providing high quality education to writers at the start of their careers. As an extension of its primary mission, Clarion West also makes speculative fiction available to the public by presenting readings and other events that bring writers and readers together. 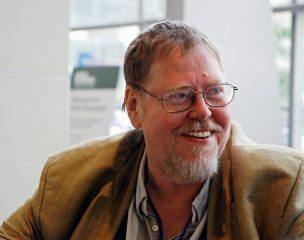 We are grieved to report that writer, editor, and four-time Clarion West instructor Gardner Dozois has passed away due to complications from a systemic infection. The loss to our community is immeasurable, and we mourn his passing. 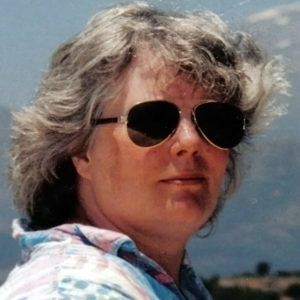 Gardner served as the editor of Asimov’s Science Fiction Magazine from 1984–2004, winning 15 Hugos and 35 Locus Awards for Best Editor. His critical work as a reviewer included a monthly column in Locus Magazine. He was a gifted writer, and his fiction won the Nebula Award for Best Short Story twice, as well as a Sideways Award. His influential work as editor at Asimov’s, along with his annual Year’s Best Science Fiction anthologies helped shape the field of science fiction and fantasy. His importance to the field was recognized here in Seattle on June 25, 2011, when he was inducted into the Science Fiction Hall of Fame. This year, Gardner was awarded the Science Fiction Writers of America’s Solstice Award for lifetime achievement. Gardner’s talent and experience as both a writer and an editor, his spot-on, constructive critical feedback, sage career advice, and innate fairness made him a great instructor. He was kind and helpful, and always honest. Gardner was well-loved and appreciated by students for his warmth and encouragement as well as his quick wit and ribald sense of humor. Celebrated for his dedication and willingness to read through daunting slush piles to discover emerging talent, Gardner was the first-time publisher for many acclaimed writers. Clarion West students were occasionally treated to Gardner’s hilarious readings of writing mistakes culled from those anonymous slush piles. They were highly entertaining as well as educational. Gardner was supportive of Clarion West, and kindly contributed comments about one of his former CW students for our Clarion West 30th anniversary anthology, Telling Tales. 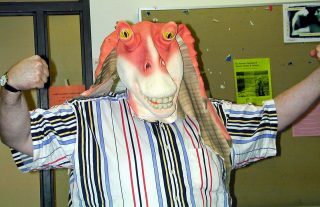 He often kept in touch with former students and offered encouragement and advice. His larger than life personality, talent and big heart will be missed, but his fiction, his impact on the writers he worked with, and his influence on the field as an editor and a critic will live on. Condolences to his family, friends, and all whose lives he touched. Thank you Gardner, for everything. 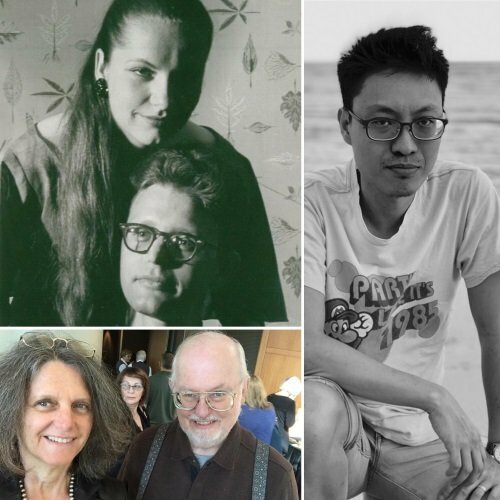 Astrid and Greg Bear have just announced the Poul and Karen Anderson Memorial International Travel Fund, a ten-year commitment to provide an annual $1,000 for one international student traveling from outside of North America to attend the Clarion West Six Week Summer Workshop. The 2018 fund has been awarded to Ted Mahsun from Ipoh, Malaysia. The travel fund will honor Poul and Karen Anderson, the parents of Astrid Bear, and their love of travel and meeting people in the worldwide science fiction and fantasy community. Science fiction and fantasy writer Poul Anderson’s many awards include seven Hugo and three Nebula awards, and SFWA’s Grand Master Award. He was inducted into the Science Fiction and Fantasy Hall of Fame in 2000. Karen Anderson was also a science fiction and fantasy writer of multiple works, and wrote the first published science fiction haiku in The Magazine of Fantasy and Science Fiction in July 1962.